What is the Great Outback BBQ? Every September, people from all over Australia gather ‘round the BBQ to show support for Aussie Farmers doing it tough. The Great Outback BBQ is an opportunity to do something fun and fundraise to make a real difference. Get the barbie sizzling with sausages or warm up the “billy” and ask your friends, family, colleagues for a donation to Frontier Services. This is a great opportunity to connect with others for a good cause! Last year, you raised $187,000 making Great Outback BBQ history! Who Does the Great Outback BBQ help? By hosting a Great Outback BBQ, you will help provide community resilience, recovery, volunteering and support to our farmers in remote Australia. Aussie Farmers living in remote Australia deserve a hand up not a hand out. By hosting a BBQ, you can support those farmers and graziers in need as well as help mobilise more people and volunteers to lend a helping hand. When do I host a Great Outback BBQ? When you registered you will have already set a date for your BBQ but this can be changed on your registration page if you need to. 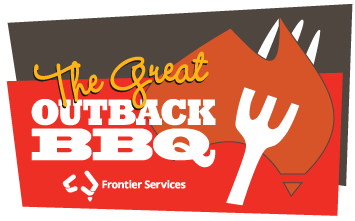 The month for the Great Outback BBQ is September and by banking your funds before 31st October you will go into the draw for some great prizes! Can I make a donation to a Great Outback BBQ team? Yes. You can make a donation to a team BBQ. Go to the home page, click "Support a BBQ" and type in the team name. Where should I mail donation cheques? Please make all cheques payable to: Frontier Services. Please ensure you write your reference number on the back of the cheque as well as include the receipt register with who the donations should be credited to. Go to the home page and select "Support A BBQ" and begin typing the first or last name. Your options will display as you type! Any donor who mailed their donation and provided an address or email address will receive a receipt via mail or email once the donation has been processed. What can I do if a cheque is written out to me personally? If a donation cheque has been written out to you personally, you may endorse the back of the check and include your reference number and mail it in with a completed receipt register to Frontier Services. It is not a good idea to send a cash donation in the mail. You may drop off the cash at Frontier Services along with your information or you can deposit the cash into your checking account and send a personal cheque from your account. Any donation made online should post immediately. If your donation does not post within 5 minutes, please contact Frontier Services. Can I enter a cheque online? You can't enter a cheque online. What you can do is enter a cheque as a pledge. This can be done in the fundraising section of your headquarters page. The status of the cheque will be pending until the cheque is received by Frontier Services. Log in with your email and password to visit your headquarters page. Select My Fundraising Report on the left side. You will then find a list of all of your donors as well as a list of all donors to your Organisation . A personal URL is a shortened link to your Organisation or personal page that you can send to friends and family in emails. A personal URL will look like this http://greatoutbackbbq.rallybound.org/ben.